Lucy Hobbs Taylor graduated from the Ohio College of Dental Surgery in February 1866. Monday, February 26th. 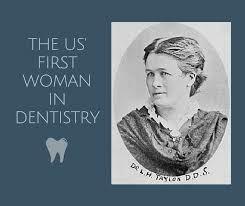 This month in 1866, Lucy Hobbs Taylor received a doctorate in dentistry from the Ohio College of Dental Surgery. She was the first American woman so credentialed, and it’s believed she was also the first in the world. Born in 1833, Lucy Hobbs at first tried to attend medical school, but finding that avenue closed to her, studied dentistry. Beginning in 1861, she practiced without a certificate as was common at the time. Following her graduation, she married James Myrtle Taylor in 1867. The couple practiced dentistry in Lawrence, Kansas, for the rest of their lives. There are some 150,000 dentists in America today. Of that total, just about 24,000 are women. You can find more facts about America from the U.S. Census Bureau online here.